Separator is designed for separation of finished mineral material in air flow. Separator relates to a group of combined ones in which the material is divided into fractions under action of centrifugal force of horizontal air flow created by fan VDN - 11,2U installed outside the separator. Separator consists of a rotor in assembly, separation chamber, middlings output chamber and finished product. 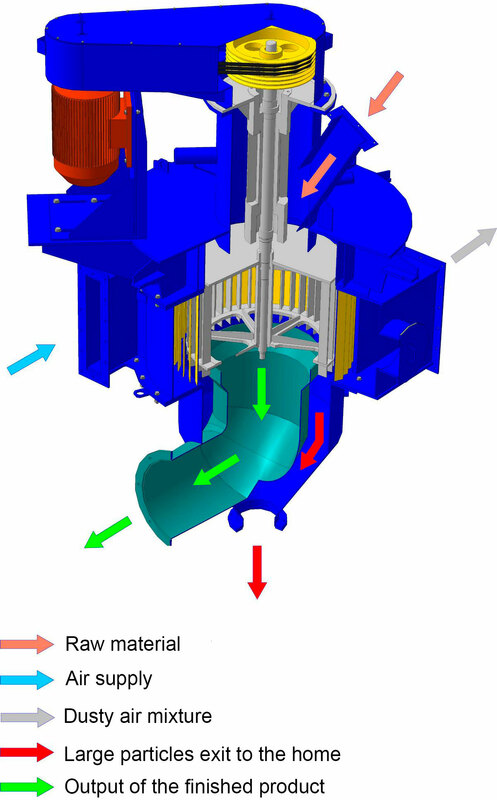 Initial material through rotor chute under influence of centrifugal force enters the circle area between the rotor box and separation chamber blades. Under the action of air pressure force supplied through separation tubes tangentially installed to the chamber, vortex flow forces created by rotor as well as particles weight forces, the material is moving along the spiral path downward. Herewith as far as moving off the loading point and approaching the middlings withdrawal chamber the decrease of material layer thickness occurs what supports more complete carry-over of small particles from it. The remaining large particles under influence of gravitation force are descending, enter the withdrawal chamber and further removed from separator through the lock control gate. The finished knock-out material is removed from the separator in a form of dust air mixture into the cyclones where it is settled. Air cleaned in the cyclones is moved again by fan through air duct system into the separator.